One of the charter responsibilities of DevOps (because it’s a charter responsibility of ops) is measuring and monitoring applications once they’re in production. That means both performance and availability. Which means a lot more than folks might initially think because generally speaking what you measure and monitor is a bit different depending on whether you’re looking at performance or availability*. This measure is critical to both performance and availability, and measures how close to “full” the connection capacity (TCP) of a given instance is. These variables are measured against known values usually obtained during pre-release stress / load tests that determine how many connections an app instance can maintain before becoming overwhelmed and performance degrades. This is often ignored but is key to determining if the application is responding correctly or not. This type of monitoring requires that the monitor be able to make a request and compare the actual results against a known “good” result. These are often synthetic transactions that test the app and its database connectivity to ensure that the entire stack is working properly. App Status and Availability can be measured either actively or passively (in band). When measured actively, a monitor initiates a request to the application and verifies its response. This is a “synthetic” transaction; a “fake” transaction used to measure performance and availability. When measured passively, a monitor spies on real transactions and verifies responses without interference. It is more difficult to measure availability based on application content verification with a passive monitor than an active one as a passive monitor is unlikely to be able to verify responses against known ones because it doesn’t control what requests are being made. The benefit of a passive monitor is that it isn’t consuming resources on the app instance in order to execute a test and it is measuring real performance for real users. You’ll notice that there’s a clear escalation “up the stack” from IP -> TCP -> HTTP -> Application. That’s not coincidental. Each layer of the stack is a critical component in the communication that occurs between a client and the application. Each one provides key information that is important to measuring both performance and availability. But to do that, you’ve got to monitor and measure the right things. Simply sending out a ping every five seconds tells you the core network is up, available and working but says nothing about the capacity of the app platform (the web or application server) or whether or not the application is actually responding to requests. HTTP 500, anyone? It’s not the case that you must monitor everything. As you move up the stack some things are redundant. After all, if you can open a TCP connection you can assume that the core network is available. If you can send an HTTP request and get a response, well, you get the picture. 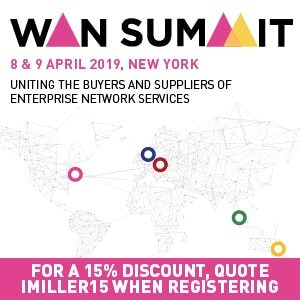 What’s important is to figure out what you need to know – connectivity, capacity, status and availability – and monitor it so you can measure it and take decisive action based on that data. 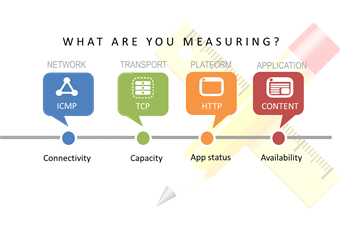 Monitoring and measuring of performance and availability should be application specific; that is, capacity of an app isn’t just about the platform and what max connections are set to in the web server configuration. The combination of users, content, and processing within the application make capacity a very app-specific measurement. That means the systems that need that data must be aligned better with each application to ensure not only optimal performance and availability but efficiency of resources. That’s one of the reason traditionally “network” services like load balancing and proxies are becoming the responsibility of DevOps rather than NetOps.